Easter comes just as farmers’ markets are crowded with new asparagus, fresh-dug carrots, and the first foraged wild mushrooms. These flavors usher in the new season, and they’re the inspiration for our simple, elegant holiday feast. These recipes ― many of which can be prepared in advance ― hit all the classic Easter marks. Glazed ham remains a stalwart favorite, paired here with a sauté of asparagus and morels. New potatoes and carrots are tossed with fresh thyme for an easy side dish. Rounding out the meal is a tender butter lettuce salad crowned with crisp parmesan tuiles. Pineapple-coconut tartlets make a refreshing finale. Butter lettuce is crisp and refreshing, the perfect foil for a parmesan-rich dressing. Although this salad is delicious on its own, the crispy tuiles take minutes to make and are well worth the effort. 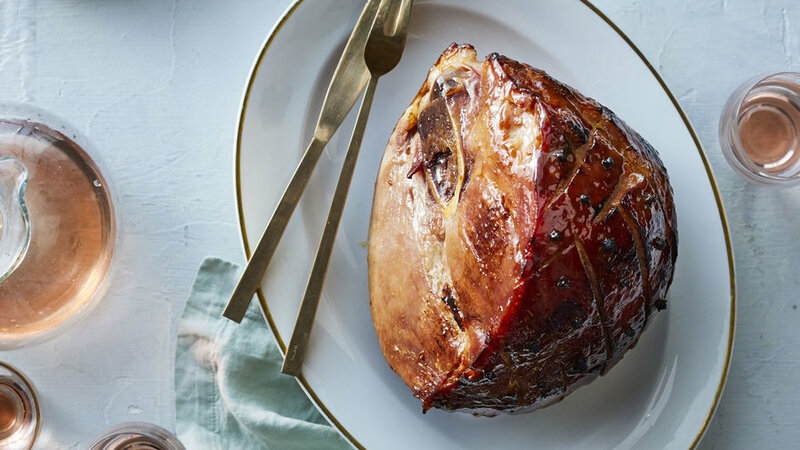 Ham is the centerpiece of any Easter meal; it’s quick to prepare and easily serves a crowd. A simple maple-mustard glaze delivers the sweetness of traditional pineapple rings and maraschino cherries, but adds a layer of spice. Sweet asparagus and spring onions go so well with the woodsy flavor of morels. All you need is a bit of butter and some crème fraîche to finish the dish. Tender spring-dug potatoes and carrots need very little fussing over. Simply roast them and toss with thyme and butter for an easy side dish. Refreshing and bright, with the tropical flair of pineapple and coconut, these little tarts are a fun departure from the usual spring desserts. Even better, most of the elements can be prepared a day ahead, then assembled just before serving.